Last year, Starbucks teamed up with the site Gilt to offer limited edition metal gift cards and they’re doing the same thing again this year because the special cards were such a hit that they sold out in minutes. The designer gift cards are made of rose-colored metal and have gold status (they’re not made of gold, alas). They’re pre-loaded with $400 and cost $450 to buy. 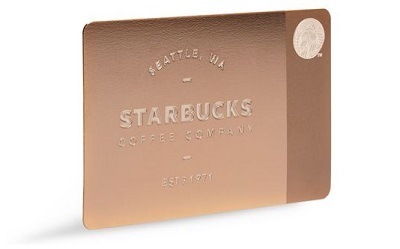 The $50 is only a little more than you would pay for the first dozen drinks that you need to get gold status and you get a very exclusive card that you can flash around your local Starbucks on top of that. It’s not a bad gift for a Starbucks lover – but it is a difficult one to get. Starbucks offered up 5,000 cards last year, and that number is being cut back to 1,000 this year. Since last year’s cards are selling on sites like eBay for more than they cost (and without the $400 already loaded! ), you can bet that people will be virtually camped out to try to buy one when they are released.